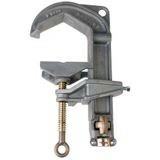 BUS-BAR CLAMP | Tallman Equipment Co., Inc. This aluminum clamp fits on the square bus up to 4" x 4" and round bus up to 4-1/2" and accepts pressure type ferrules. Fault current rating of 43,000Ah for 15 cycles and 30,000Ah for 30 cycles.